Following the success of last year’s event, the local Goulburn Parkinson’s Support Group is putting on its second annual Parkinson’s fundraiser. All proceeds go towards assisting to fund a specialist neurological nurse trained in the care and treatment of people with Parkinson’s. (02) 4821 3355. Dinner and two drinks included in the price. 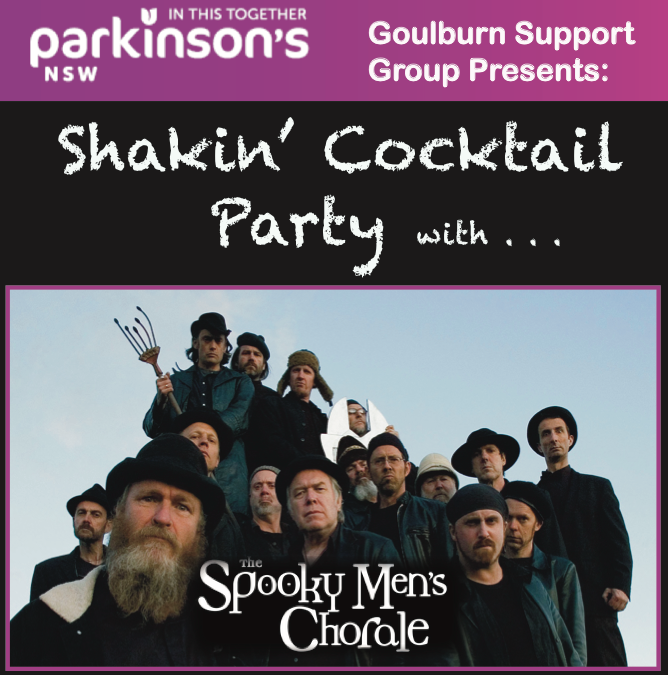 Back by popular demand, the Spooky Men’s Chorale will once again be your entertainment for the evening. So put on your little black dress and your fancy slacks, you are in for a night of fun! Although ‘shaken, not stirred’ may not be a choice for people with Parkinson’s, a selection of cocktails will be available on the night. Raffle tickets will be available at the door. Fundraising chocolate and tulips (the Parkinson’s flower) are also available for purchase on the night.